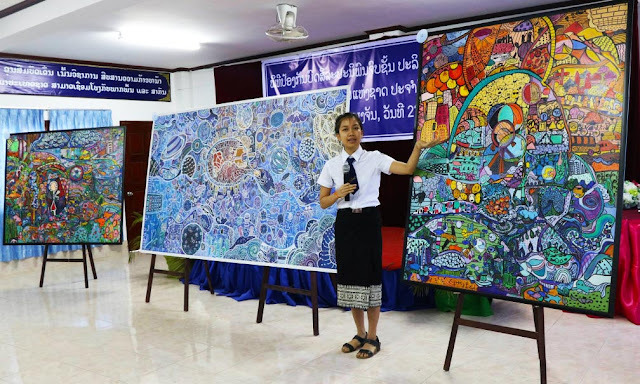 Lao National Fine Arts Institute organised their annual final thesis presentation for its Bachelor(BA) degree course students on Thursday in its meeting room. The event was chaired by Director of Lao National Fine Arts Institute, Dr Maysing Chanboutdy and Deputy General Director of Fine Arts Department, Dr Khamsouk Keovongxay; and attended by organising committee, judging panel, honoured guests, teachers and students. About 20 students from the four main subjects of fine arts including painting, drawing, mono print, and carving took their turn to go on the stage and present their artworks such in real practice.